Much like the game's new guns, many of the new Halo game's action figures have also ditched the trademark purple. For orange, yes, but also for a whole lot of blue. Halo 4&apos;s New Guns Aren&apos;t Purple, They&apos;re Orange! Halo 4 has new bad guys, and those new bad guys have new guns. Here are those new guns in action. 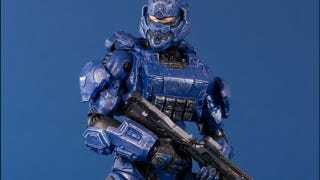 I took a look at the first series of Halo 4 figures from McFarlane a few weeks back, but the second wave is due out this month, so we may as well take a look at them too. Those Promethean guys look pretty good! Cortana, despite the inclusion of some cool accessories, does not.